I start thinking again about Tussie-Mussie and Boutonnieres due the request of one of our friends to help them making the floral arrangements at their wedding. Hystorically, a tussie-mussie (known also as nosegay) is a small, exquisite cluster of flowers that can be used for almost any occasion: to express congratulations and birthday greetings or to decorate festive tables at celebration gatherings. I have made bridal bouquets (Tussie-Mussie), assorted hand-held bouquets for maids and boutonnieres for few bridal showers and weddings. 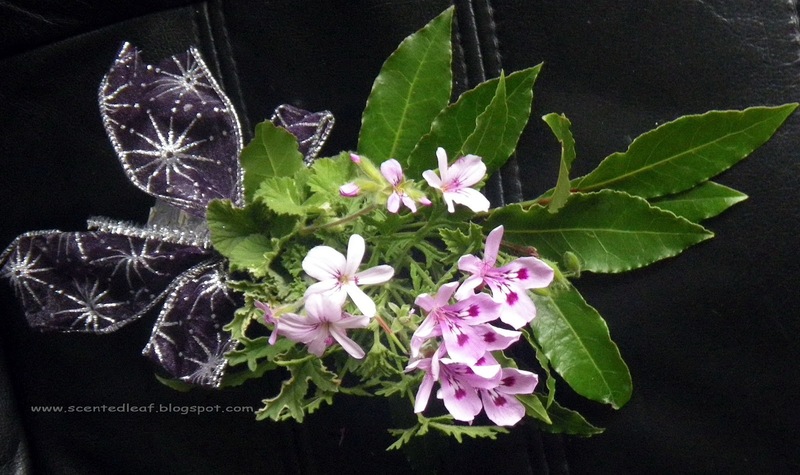 Of course, I've used all the time scented pelargoniums leaves and flowers. 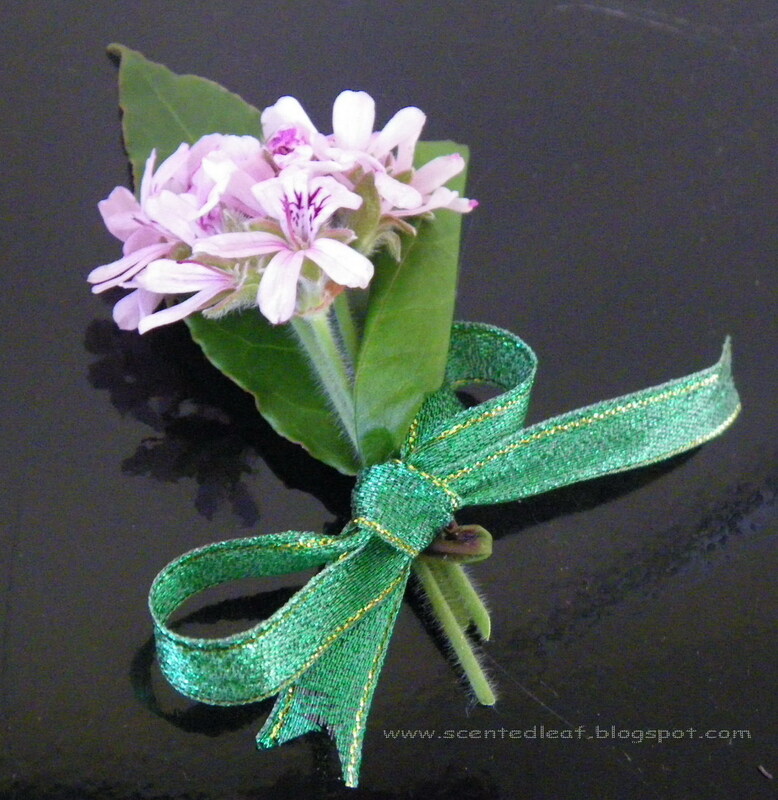 I like to combine various scents and even to add small branches in bloom when making them. The symbolic meaning of some of the leaves / flowers used in those dainty arrangements has been inherited from old times. There are dozens of floral dictionaries already published, but I mention just the meanings of my favorite plants: red geranium flowers for health and protection, pink geranium flowers for grace, beauty and devotion, mauve geranium flowers for faithfulness, white geranium flowers for friendship and loyalty. The scents and shapes of the leaves also have kept their meanings over the years: the rose-scented and lemon-rose scented crinkled leaves for true love and friendship; balm or lemon-balm scented pelargoniums for sympathy, pine-scented fern-leaved pelargoniums (filicifolium) for sincerity , oak-leaved pelargoniums for true friendship, nutmeg-scented pelargonium (xFragrans) for loyalty. Of course, in my floral arrangements you may find not only pelargoniums and geraniums. Talking through their meanings, I'm using also other plants like Bay Laurel leaves for victory, baby's breath for innocence, roses for preference, friendship and true love, rosemary for remembrance, red basil for best wishes, marjoram for kindness and courtesy and myrtle for fidelity. You can let your imagination and creativity to run when tie flower bouquet with rubber band and strips of fabrics assorted with the theme of the event. It is a delightful task of playing with colors, textures, scents when arranging flowers and herbs together, until you have the type of tussie-mussie you want.